Do you have a child or teenager and are worried about them developing cavities? Or maybe they already have cavities and you cringe to think they could develop more. 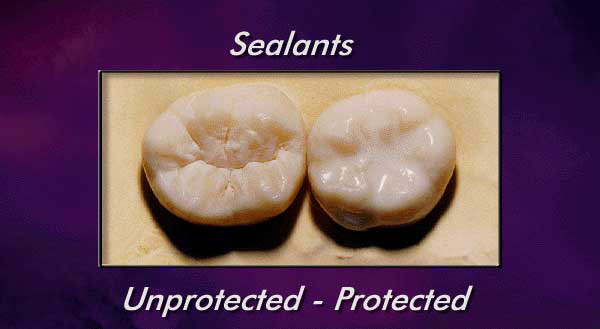 Sealants could be an option for your child or teen, and they make effective protective barriers for adults, too! Dental sealants act as a barrier for your teeth, protecting them against decay-causing bacteria. Sealants are usually applied to the chewing surfaces of the back teeth (premolars and molars), as this is where decay occurs most often, especially in children and teens. Cavity-prone adults may benefit from sealants, too. A sealant is a composite material which bonds into the depressions and grooves of teeth. These are places where it’s often impossible for a toothbrush to reach during your regular brushing routine. Children and teens benefit from sealants as their proper brushing habits often haven’t been refined or they regularly skip brushing. You can help protect their teeth with sealants, which will effectively block bad bacteria and plaque from accumulating in those hard-to-reach grooves in the teeth, which can cause cavities and decay. The procedure is painless and usually only takes a few minutes. Sealants can put extra power behind a sound prevention program of regular checkups at our Asheville family dentist office, flossing, and twice-daily brushing. Sealants can last for up to a few years and then can be reapplied by your Asheville dentist, Dr. Saunders. Having sealants doesn’t mean that you can skip brushing and flossing. This type of protection is meant to enhance your oral hygiene care, not replace it. Sealants are made of a plastic-like material that covers your tooth. It bonds to the tooth as soon as it’s applied, and can hold up to the pressure of regular chewing. Sealants get their name from effectively “sealing out” bad bacteria and plaque buildup that can cause tooth decay and cavities. Has deep grooves. When your teeth have deep grooves that are impossible to clean with a toothbrush, you might want to consider dental sealants. These are perfect places for food to get trapped and bacteria and plaque to grow. Sealants can seal all these cavity causers out and protect your teeth along with your regular brushing and flossing routine. Has a high risk for cavities. If you have numerous cavities and every time you get a checkup you have more, you may consider getting dental sealants. These can help prevent cavities and save your teeth from having to get fillings! Has poor oral hygiene. If you have poor oral hygiene habits, talk with us about changing them. Sealants can help protect the care you do take of your teeth and prevent cavities. First, you’ll talk with Dr. Saunders to determine if sealants are a good choice for you based on your oral hygiene history, cavities, and other factors. During your appointment at our Asheville dental office to get sealants, the tooth or teeth getting the sealants will first be cleaned. Then your tooth or teeth will be prepped for the sealant by ensuring that the surface is rough enough to allow the sealant to bond. The tooth or teeth are then dried. After this, the sealant will be applied and Dr. Saunders will use a special light to harden the sealant. After the procedure is complete, you can leave the office with your newly protected teeth! At our Asheville dental practice, we can help determine if sealants would be a good fit for you or your children. Not every patient needs sealants and we don’t recommend them to patients for whom they aren’t necessary. However, you or your children could benefit from dental sealants! Call and talk to our office manager and make an appointment with us at 828-277-6060. We’ll happily discuss the pros and cons of sealants and if they’re right for you or your child.